PAMECA Project in close cooperation with General Prosecution Office organised a Round Table on raising the awareness on the right to access to information and criminal prosecution. 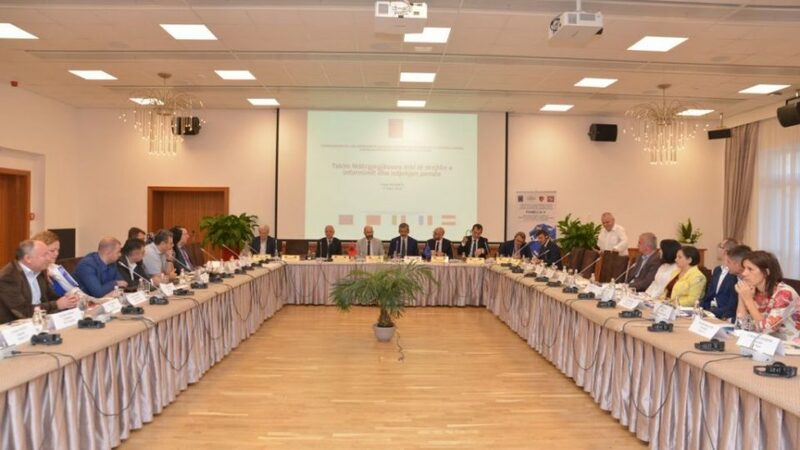 This activity was held in view of the new legal framework of Justice Reform with consideration to the right to access information and criminal prosecution. The Round Table opened by PAMECA Team Leader, Mr Carlo D’Achille, and the Director of Directorate for the Interception of Electronic Communications and relations with Intelligence Services at the General Prosecution Office, Mr Thoma Jano, joined together the Coordinators/Prosecutors of the District Prosecution Offices responsible for media relations and journalists who cover this field, to give a clear picture of their cooperation with the dedicated structures on public relations. The event was moderated by the Media Advisor of the General Prosecutor, Mr Denion Ndrenika and by Mr Carmine Pirozzoli, PAMECA Expert on Organized Crime. The keynote speech was delivered by Mr Rosario Aitala, former Prosecutor and now Judge at International Criminal Court who introduced to the audience the international principles and standards in giving access to information and criminal prosecution to journalists, suchlike impartiality; timely dissemination of information; respect of human dignity; secrecy and confidentiality of information; protection of vulnerable categories of human beings, especially minors. Representatives of the Prosecution Office provided a detailed update of the legal framework and standard procedures to be applied by journalists in order to have access to information and criminal prosecution. The establishment of the position of Coordinator was considered as a positive step forward to the institutional transparency and in enhancing the relations with media. The journalists attending the Round Table posed many questions to the prosecutors and requested stronger competences and discretion to be granted to the Coordinators in giving access to information to the journalists. The activity was attended by representatives of Association Press and Professors of the Department of Journalism that actively and professionally discussed with the participants. The closing remarks of Mr Giovanni Pasqua, PAMECA Expert on Human Resources labelled this fruitful roundtable as a beginning of future such meetings and discussions, including also attorneys and representatives of law enforcement agencies important in this area, such as the Albanian State Police.